The island of Crete is famous for its food, its extensive history and its breathtaking green and blue landscape that stretches across the horizon. 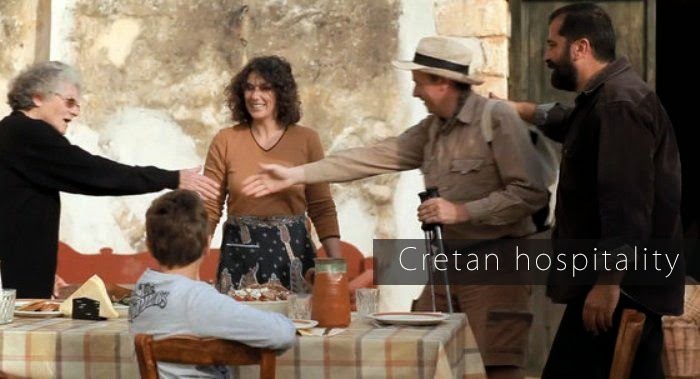 Crete is also famous for its friendly people; every single one has a story to tell and you won’t be short of invites to dinner, for coffee, for lunch or a snack. Perhaps you could say Crete’s real star attraction is its people. Cretans are warm and friendly, into exaggerating and grand gestures. The Cretan soul from ancient times takes a passionate approach to their courage, love of their country, freedom, nature, friends, family and strangers. For Cretans there are no boundaries. You have been warned! Of course, Crete is also made for exploring the great outdoors, with friends, new or old. There are countless coves and beaches, rugged hills which perfect for hiking, turquoise waters and picturesque villages. Live like the locals and learn the heartbeat of the island. It’s an intimate kind of holiday and feels like you’re surrounded by family. In every village the huge portions of food, big smiles and kindness will melt your heart. Give them back a smile in return, make the island yours; Cretans make you feel comfortable, Crete is yours.